Craving a cold one? As one of the oldest beer-spiked refreshers, shandies are a long-time favorite of England’s working class. They traditionally combine light beer with lemonade, soda or ginger beer. Here are three variations for your summertime imbibing. Classic Lemonade Shandy. It doesn’t get easier than this. Simply mix equal parts lemonade and beer (try a pale ale or IPA) and adjust to taste. You can use store-bought lemonade or for a quick homemade version, combine equal parts honey syrup (1:1) and fresh lemon juice and dilute with water to taste (usually about 3 times the amount of lemon juice). Belgium Sucker Punch Shandy. For this refresher (pictured), Jasper’s Corner Tap & Kitchen in San Francisco updates the classic formula with a botanical burst of gin. 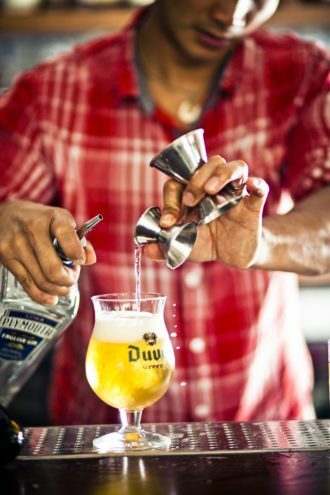 Just add 1 ounce of gin and a ¼ ounce of fresh lemon juice to 10 ounces of a light-bodied Belgian brew, like Duvel, and stir. Gin-Cassis Shandy. Adapted from the Fowl Friar cocktail at the Fifth Floor in San Francisco, this shandy ups the ante with gin, a quick-infused vermouth and cassis. To start, infuse 2 teaspoons of loose-leaf Earl Grey tea (or 2 teabags) in 375 ml. of blanc-style vermouth for 30 minutes and strain. Then shake together 1 ounce of gin with a ½ ounce each of fresh lemon juice, infused vermouth and crème de cassis with ice. Strain into a footed Pilsner glass and top with 6 ounces of a wheaty white ale.